Can the materials used decompose? Are the materials used efficiently reducing it’s carbon footprint? Are the materials used efficiently using natural ingredients that aren’t intrusive to the Earth’s resources? Today’s featured image shows an example of one of my favorite brands, Seventh Generation. 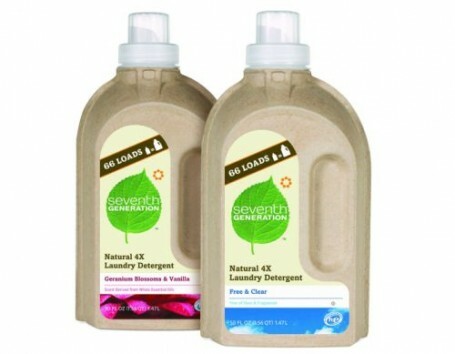 In our own home we have shifted to purchasing our cleaning products (laundry detergent, kitchen, and bathroom cleaners) and paper products (toilet and paper rolls) to Seventh Generation. Ecovative has been working with NOAA, 3M, and have also mentioned “developing new apparel, liquid absorbing mats, a developing nations appropriate process, and more”. They have also built a brand called Ecocradle which is mushroom packaging that has been used by DELL, Steelcase, NOAA, and Puma. We look forward to researching and finding more companies that are promoting Sustainable Design and also the Four R’s — Reduction, Reuse, Recycling and Recovery.